They list them as “short adventures” for Boot Hill but, as no stats are provided, they’re perfect for ANY game set in the American West. Everything you need for a bit of mining or an improvised mule explosive. The labels make me believe he’s more merchant than miner. Other than a cool picture, why would you have labels on everything you are carrying? What would you think when you came across this fellow and his load heading up the trail into the mountains? The crack of a gunshot interrupts the noise of the saloon in the Gold Hill Hotel. A woman screams. A man shouts to fetch the doc. Someone has been gunned down. The PC’s are enjoying an uneventful night in Golden, Colorado when the gunshot interrupts the reverie. All the patrons spill from the door of the Gold Hill Hotel onto the street. A hundred yards away, a man writhes in pain on the ground surrounded by a number of onlookers. The glint of a badge reflects in the moonlight as Sheriff John McCoy arrives. The PCs can either volunteer or be selected from the crowd. Wilson was not successful in getting away with the horse. Wilson has not yet left the town. Sheriff McCoy wants to temporarily deputize the PCs to track down Wilson. If they agree, a hasty plan to scout the town for the outlaw is drawn up. Wilson is holed up in a barn on the outskirts of town. If cornered, he’ll surrender peacefully. If he believes he can escape, he is not afraid to engage in a gunfight with a single opponent. Brazen daylight robbery of the U.S. Army payroll on its way to Fort Laramie leaves 5 dead and three wounded. Over $12,000 in silver and gold coins were taken and the bandits are still on the loose. News of the robbery quickly spreads south to Denver. The theft occurred just over 30 miles north of Denver near the town of Erie. Rumors conclude the mayor of Caulfield, Joseph Webb, was involved. U.S. Marshall William Frank begins to organize a posse to seek out the gang. If the PCs are law men, they will be tasked with aiding in the search or they can volunteer. Webb is indeed the ring leader. He along with his son, William, brothers Lyman and Warren Follett, and a dozen or more cowboys attacked the payroll shipment. The shipment was lead by Captain Joseph Whim who was accompanied by Corporal Isaiah Meade and ten enlisted soldiers. The payroll party was travelling along a narrow roadway along a moderately narrow canyon. As the party neared the narrowest portion of the canyon, gunfire erupted from both sides. The Army detachment was quickly pinned down. Four members were killed immediately including Captain Whim and 3 soldiers. Taking command, Corporal Meade eventually called for a retreat as his force was unable to defend the payroll wagon. Five masked men descended the west canyon wall and escaped with the payroll strongbox. Shortly afterwards, the bandits stopped firing and one of the uninjured soldiers was able to ride for help. Unfortunately, another soldier succumbed to his wounds before aid could arrive. The bandits have escaped into the mountainous terrain near Lyons, Colorado. Currently holed up in a remote canyon, most of the members are planning to ride over the mountains and head south into New Mexico. Webb plans to use their share of the theft to fund payment for business contracts he signed but could not meet. Those contracts include supply orders for beef and feed to the U.S. Army. If the bandits are tracked within 3 days, they still be in the canyon near Lyons except for Webb and his son, who return to Caufield the day after the robbery. They plan to rendezvous with the other bandits on the 4th day near Boulder, Colorado to gather up their share of the payroll. This adventure is based on the Wham Paymaster Robbery in 1889 Arizona. 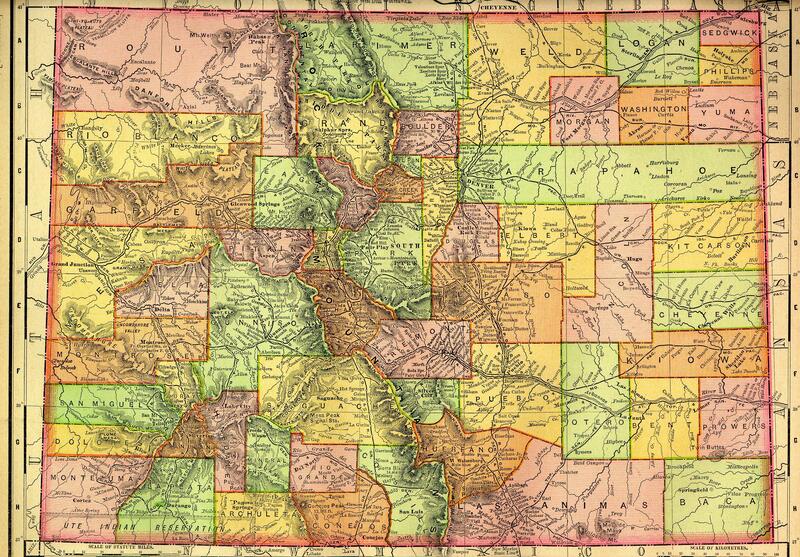 Should you need a geographical aid for Colorado, you can use the 1895 Map. Ripped from history – Soapy Smith was a legendary con man. His reign ran from Texas through Colorado and onto Alaska. Soapy is setup outside the popular Tivoli Saloon and Gambling Hall just as a train has arrived at nearby Union Station. He has agreed to pay to the owners of the Saloon a share of the profits. As the traffic from the train begins to arrive near the Tivoli, Soapy whips into action working in tandem with a pair of shills in the crowd. The first seemingly astonished customer walks away with $100. The second is nearly as happy with $20 for his $1 investment. Beyond his short cons, Soapy is also running a series of long cons involving fake railroad stock and a false lottery. Soapy is careful not to swindle locals, which could lead to trouble. Instead, he continuously takes advantage of the open gambling policy of Denver. His network of associates and friends includes most of the local saloon owners, a handful of city officials, and the local sheriff. The PC’s are approached by an Chicago based cattle merchant, Landry Thomas. Landry explains his wife and daughter were swindled by Soapy and he’d like to recover the money. The law is not in his favor but still he wants to pressure Smith. If the PCs agree to the task, they can find Soapy playing cards in the Tivoli Saloon. He will engage the characters in conversation trying to deftly determine how intent they are on recouping the losses. Smith is more interested in earning more money than retaining the winnings from two individuals. He will attempt to bribe the PC’s with matching pay from Thomas. If that fails, he will bribe them and even offer them lucrative work as shills and gamblers. As a last resort, he will offer to return the women’s losses rather than be drawn into a violent dispute. If Smith learns that Thomas is a cattle merchant, he will dispatch some of his crew to sell him a futures bid on Colorado Cattle. Smith will not be directly involved and has no intention of delivering the cattle. Jefferson Randolph “Soapy” Smith – As pictured; a charismatic fellow with the gift of gab. Dark hair, full beard, well dressed. Guest Appearance: Bat Masterson – Worked as a card dealer in the Tivoli. Read more about Soapy at Alias Soapy Smith or Legends of America. Jefferson Randolph “Soapy” Smith has already been used as the basis of a previous con based adventure. Smith was legendary in his ability earn money and one of his stranger baits was the introduction of “McGinty” the petrified man during his time in Creede, Colorado (and later in Denver). According to Smith, McGinty was purchased from miners in the area who unearthed him while working a claim. The McGinty man is designed to draw visitors into The Orleans Club in Creede. While waiting in line, every visitor is encouraged to engage in games of chance, all favoring the house. The games include shell games and 3-Card Monte. This short adventure is a sidebar to any ongoing campaign idea allowing for open-sandbox style running. Perhaps the characters are drinking heavily and want to see the petrified man. Along the way, they gamble more than they should and take heavy losses. Alternatively, they may be trying to meet Soapy for another reason. He’s preparing to move McGinty to Denver and needs some help. Transporting an artifact, even one of questionable origins, is going to be a challenge over the rough roadways. The McGinty story is a good story as added flavor to add to any adventure featuring Creede or another fictional locale. During its reign as an exhibit, the petrified man will certainly draw attention. Jefferson Randolph “Soapy” Smith – a charismatic fellow with the gift of gab. Dark hair, full beard, well dressed. A silver boom has hit Creede and the miners are thirsty. Two Denver brewers vie to dominate the market. The silver rush in Creede, Colorado has just begun in earnest. A market of thirsty miners consume every bottle of liquor that makes it into town — most of it sold directly off the delivery wagons. Two brewers and liquor merchants are vying to dominate the insatiable thirst of the miners and settlers. Adolph Herman Joseph Coors, founder of The Golden Brewery (aka Coors Brewery) has teamed with a local liquor importer, Walter Murray, to ship beer and spirits to Creede via train and then wagon. The effort is well funded and supplied due to Coor’s connections to the area. Unfortunately, Colonel Charles Thorne (owner and proprietor of Apollo Hall) and his business partner, Elijah Overton, have begun regular shipments to the Creede area. Overton is the lead in the effort is sending weekly wagon trains filled with liquor and beer of questionable quality. Overton has no interest in a competitor springing up and eroding the massive margins on cheap booze. Overton and Murray were seen in a heated argument over the business in Creede. Overton failed to dissuade Murray and has resorted to hiring ruffians to disrupt the Coors/Murray shipments. The first shipment of Coors products is lost just west of South Fork as it entered the narrow trail heading northwest into Creede. Although no one was injured, the trail boss and several drivers reported seeing masked men skirting along the cliff overlooking the trail. Overton has learned of the next shipment and has instructed his employees to raid the shipment after it leaves Del Norte. They are instructed to capture the shipment but avoid harm to anyone if possible. The stolen shipment will then be diverted to the Durango/Silverton region. All contents, wagons and horses are to be sold to Ike “Big Boy” Sullivan, a unscrupulous merchant operating in the area. The bandits can split any proceeds from the sell among themselves as a bonus. If the second shipment is lost, Murray will immediately begin to organize a third shipment under heavy guard. Coors will balk if any lives have been lost and eventually pull out of the partnership. However, he will still sell beer to Murray but will not condone any violence. Should the second shipment have been sold by the outlaws, most will fail to respond to another order from Overton. Instead, they will be dispersed throughout the area spending their earnings or moving on to other pursuits. The 3rd shipment is likely to make its way to Creede after a short gun battle a few miles out of the camp. Overton will continue to escalate the situation until he resorts to hiring murderous outlaws and gunman. Should they resort to outright killing, the encounter will bring the dispute to the attention of lawmen. Overton will eventually admit failure but not without a continuing fight. As noted in the text above. A steam locomotive derailed two miles outside of Idaho Springs late yesterday. No injuries have been reported but the engineer is missing. One of seven trains daily, Engine #9 was on its return trip from Idaho Springs to Denver. Passengers report the train was travelling faster than normal. The engine, coal car, and a cargo car all left the tracks and toppled down the grade along the rail bed. The two passenger cars and caboose decoupled and remained upright on the tracks. After the crew and passengers disembarked and sorted through the chaos, Jim Wheeler was discovered missing. Wheeler had been the engineer of #9 for the last two years. Considered a solid employee, Jim is a dedicated employee having never missed a day of work. After he is discovered missing, the able bodied passengers and rest of the train crew search the immediate area. Jim’s cap is found near the engine. It is stained with blood along the bill and right side. No other signs of him are found. As evening arrives, another train is brought in to transport the passengers back to Denver. The search is halted due to darkness but the local railroad manager, Christopher Carter offers a reward of $50 for aid in finding Jim. Unbeknown to Carter, Wheeler has racked up a significant gambling debt he was due to pay upon his return to Denver. The prior day, he hid a horse and supplies about three quarters of a mile west of the derailment site. He’d planned to jump from the train and disappear from the area. Unfortunately, as he was exiting the engine, he inadvertently knocked the throttles forward leading to the derailment as the train rounded a sharp turn at high speed. His plan never involved derailing the train or injuring anyone. He assumed the fireman would notice his absence and stop the train but he’d be well on his way. Unfortunately, the fireman was moving coal from the car into the engine hopper and didn’t notice in time. The player characters should be passengers on the train and immediately become involved in the drama of the wreck and search for Wheeler. One or more of them may have met him in passing. Alternatively, they could be hired by the gambler, Slim Amendola, to track him down and recoup the $900 of debt he owes. Wheeler is riding hard to the west toward Frisco. He avoids towns and only spends a few hours camped the first night. He plans to turn south at Frisco and make is way south through South Park toward New Mexico. Although Jim is armed with a revolver and rifle, he will avoid confrontation. He will surrender to anyone rather than fighting. If he can slip away from pursuers, he will.